Freakonomics and Superfreaknomics – the bestselling books of Steven Levitt and Stephen Dubner are no longer news to the readers of this blog. However, their new work – Think Like a Freak is worth a shout-out. In Think Like a Freak, Levitt and Dubner use their famed unconventional analysis in explaining the hidden side of things. The readers of Freakonomics will recognize the authors’ thinking process and their unorthodox approach. But their compelling story telling and the new topics covered make this work a page-turner for anyone interested in behavioral economics, or in simply thinking outside of the box. In less than three hundred pages, the book covers topics from politics, business, and medicine to food eating contests and magic. My favorite part remains the story of Takeru Kobayashi, a slim Japanese man who becomes famous after eating fifty hot dogs in a hot-dog eating contest, and essentially doubling the world record. Kobayashi is what Levitt and Dubner define as a Freak. However, it is not an abnormal stomach – the obvious explanation that came through my mind – that makes Kobayashi a Freak, but his thinking and the way he approaches the hot-dog-eating problem. On the other hand, the obvious can also be our friend. For instance, you will find out why it is harder for magicians to fool children than adults. It is simply because children are more curious than adults and they don’t overthink magic tricks. If you want to think like a Freak it is imperative to stay curious and realize that sometimes the solution to what looks like an impossible puzzle is in fact the obvious. 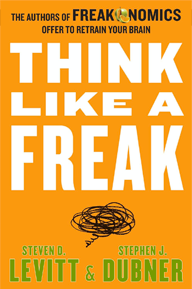 Think like a Freak is about refusing to accept conventional wisdom as fact, and daring to look at the world around you from a different perspective.